The New Orleans’s St. Patrick’s Day parade dates back to 1947. For a complete history of the parade, click here. TThe Parade procession kicks off at 1:00 p.m. on Napoleon Avenue, turning onto Magazine Street and ending on Jackson Avenue. Parade viewing and block parties are free and open to the public! You can view the parade along the parade route or at a private establishment. 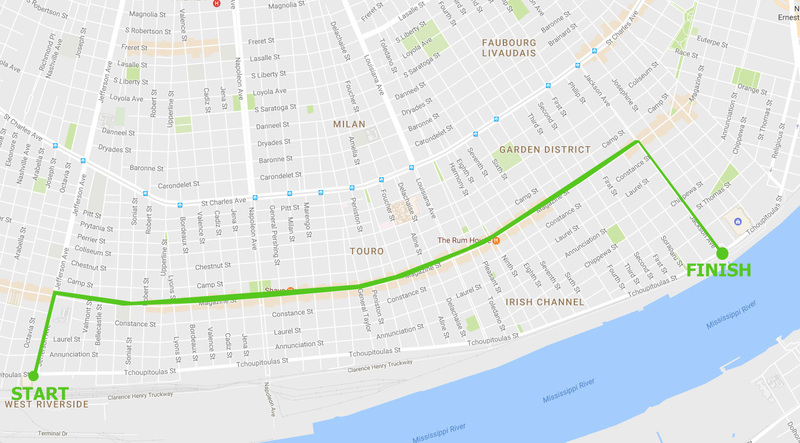 View a larger printable PDF version PDf the New Orleans St. Patrick's Day Parade Route Map here. The parade now includes representatives from New Orleans's Irish groups. It will include floats, trucks, marching bands and second-liners. Throws include beads, doubloons, flowers, moon pies, and of course, vegetables. Those that experience the luck of the Irish may catch some cabbage from a passing float or receive a kiss from one of the walking club members. The celebration will begin with mass held at St. Mary’s Assumption Church at noon, and the parade will follow immediately after. Block Parties: Want to continue the celebration? Find your pot of gold at one of the St. Paddy’s block parties. Parasol’s Bar located in the Irish Channel celebrates the holiday with a blowout party throughout an entire block of the neighborhood. On both Saturday, March 11, 2017 and Friday, March 17, 2017 green beer, local flavors and even -leprechauns- crowd the area from 10 a.m. to 8 p.m.
Annunciation Square holds another block party on Friday, March 17, 2017 to benefit St. Michael’s Special School. From 10 a.m. to 6 p.m. arts and crafts, local eats, wine, beer, Irish music and dancers will fill the playground to commemorate the holiday. For more information about St. Patrick’s Day festivities, visit www.irishchannelno.org.